A new page has been added to our Menu for players wanted for regular engagements with bands, groups, social clubs. hotels, holiday venues and cruises etc. The details are given in good faith and there is no charge for the service. Items will be left on for 90 days, unless we are advised that the item is no longer applicable. LIVELY LETTERS have appeared in our GUESTBOOK and have caught us by surprise because they have taken an unexpected route. We don't mind fair and balanced comments along these lines if it helps to get matters off your chest and keep your blood pressure down. However, we have to say that lively letters are not intended to be the main feature of this website but they may help to draw attention to the players who have their own independent websites that are not listed in some other player directories. Chris Powell replies to a letter about a controversial feature spot on the Organfax Internet radio programme that he presents. Matthews Bason replies to a message and gives his views about the Organfax website. Alan Ashton writes about Phil Kelsall and also the fact that he proudly wears the cap of the oldest presenter of any organ related radio programme. 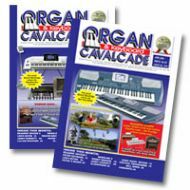 New entries are being added on a regular basis - as and when requested by keyboard-organ players who have their own website that are not linked from any other Internet directory. New links in Menu to keyboard news websites. More players with their own websites added to our list - item 2 on Menu. We are pleased with the Spanglefish website hosting service. Their websites are hosted free of charge with Google advertisements. We have to mention that we are not directly associated with these advertisements and do not endorse them in any way whatsoever. It should be noted that information on this website is given in good faith. We would like to think that we are listing player websites that do not appear in any other directory. No responsibility can be accepted for any errors or omissions, which will be rectified if they are politely brought to our attention.